Chakrasana would be another pose in the asthanga vinyasa tradition i think though. Yup that’s right. 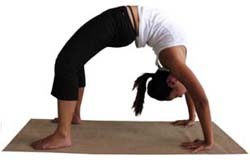 the terms Chakrasana,Urdvha Dhanurasana,Upward Bow and Wheel can be used interchangeably. However in the context of Ashtanga, it means Backward Somersault and is performed at the end of the vinyasa sequence.